Bingo Beez are revving up for Halloween with a joke competition. Did you hear the one about the skeleton who swallowed 90 bingo balls? If you want to know the answer, get to Bingo Beez. And while you’re at it, submit your own jokes. If Bernadette chooses yours as her favourite, you will win a $20 Amazon voucher. Also at Bingo Beez this week — if you make any deposit before Halloween, you will get entered into a $40 Cauldron Cash Draw. Pray to the ghouls and ghosts that your name comes bubbling out of it on 1 November. If you call house at Bingo Beez anytime this Halloween week, you will get entered into a $40 Haunted House prize draw. Once again the winner will be picked at random on 1 November. Spooky, or what? 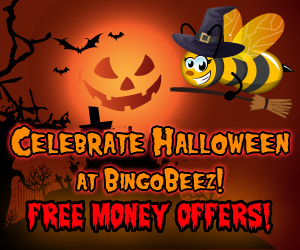 Make sure you are at Bingo Beez on Halloween 31 October too. Look out for $100 Must Go bingo games with an enormous a $300 jackpot up for grabs. Games start at a frighteningly low 25c, and they will be taking place between 2 PM and 10 PM. Throughout October, Bingo Beez are giving three players the opportunity to win a fabulous Polaroid 10 megapixel digital camera with 3 inch LCD display. To win this gorgeous gadget, you just have to play the most bingo online and it could be yours. One last thing — everybody at Bingo Beez is buzzing about the $5 free bingo bonus — join their Facebook Page, and it will be yours. Just make sure you make a deposit of $20 first to claim it. That means there is just one thing left to do — get to Bingo Beez like there is a swarm of bees behind you. But these ones don’t sting — they help you win money!